The most unexpected thing to find in Colorado, and at 8,700 feet above sea level and 1,000 miles from the nearest ocean, is 30 acres of sand dunes, towering 750 feet above the surrounding high prairie in the San Luis Valley. 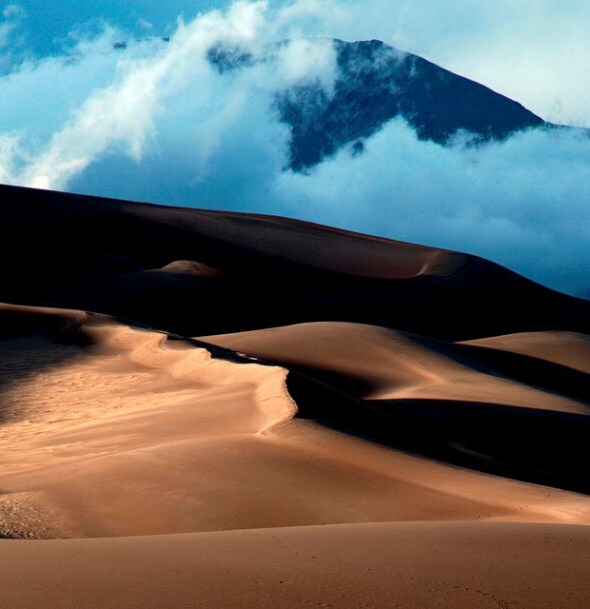 It’s Great Sand Dunes National Park. Geologists believe it happened this way: Huge uplifted plates of rock, and volcanic activity, created the mountains that surround the San Luis Valley. The valley filled with water, and sediment washed down from the mountain ranges, forming a huge lake. When the lake and its smaller successors dried up, a sand sheet was left behind. Prevailing winds blew the sand into a natural pocket, and shifting winds formed the sand into the tallest dunes in North America. More than 11,000 years ago, nomadic hunters and gatherers arrived in the San Luis Valley and at the sand dunes, leaving behind large stone spear or dart points now identified as Clovis and Folsom points. Chances are they were on the trail of the mammoths or bison that lived in the area. Later, modern Native Americans from the Ute and Jicarilla Apache tribes lived in the area. Their descriptive names for the dunes are “the land that moves back and forth” and “it goes up and down.” For these early visitors, the dunes were a sacred place. White explorers encountered the dunes during the 1600s, but Don Diego de Vargas took the honors for being the first known visitor to follow a herd of bison into the San Luis Valley. The valley became a route for an eclectic parade of travelers heading to Santa Fe or the increasingly populated high prairie. The area was consequently repeatedly “discovered” by one European explorer after another. Homesteaders began to settle in the valley and next to the dunes in the later years of the 19th century. Gold miners, convinced by enthusiastic local newspapers that the dunes were mountains of gold, set up placer operations and a gold mill on Medano Creek. They were disappointed. In the 1920s, determined to save “their” dunes from industrial incursions, the Ladies P.E.O. (Philthanthropic Educational Organization) of the San Luis Valley demanded protective national monument listing for the Great Sand Dunes. In 1932, President Herbert Hoover obliged. In 1990, the monument also became a national park and preserve. The park is 35 miles northeast of Alamosa. The dunes share the 150,000 acres of the park with other natural wonders – rich wetlands, soaring peaks of the Sangre de Cristo Mountains, lush grasslands, alpine lakes and forests, tundra – adding up to some of the most diverse ecosystems in North America. The Visitor Center offers a 20-minute overview film about the park, an exhibit of beautiful photos and art of the area, restrooms, a snack area, interactive exhibits and a book and gift store. The center is open daytime hours every day except winter federal holidays. The park itself is open 24 hours every day. Rangers lead tours year-round, and the Nature Conservancy leads hayride or 4-wheel-drive tours of the grassland that is home to a 2,000-head bison herd. The Conservancy owns the 100,000-acre Zapata Ranch next door to the park, which preserves unique habitat, wildlife and ranching history. Visitors first are drawn to the dunes, where snowboarding, skiing and sledding take on a whole new complexion. Snowboards and sleds specially surfaced and shaped to slip down the dunes can be bought or rented from local sporting goods stores. (The National Park Service recommends Kristi Sports.) There’s also great fun to be had just tumbling through the shifting sand or hiking through the area, picking your own route (there are no trails in the dunes area). Caution: The sand can reach 140 degrees on a hot summer day, so shoes and protective clothing may be necessary. The Visitor Center has a dunes-accessible wheelchair for free use. Beyond the dunes, there are many areas to explore. Medano Creek, which runs along the base of the dunes, is excellent for a cool off. Mounds of sand washed into the bed of the stream create waves called surge flow and may support skim boarding or tubing for kids. It’s an elusive pleasure, however; the creek is shallow at best (May and June are usually peak months) and may completely dry up in the heat of summer after a dry winter. The National Park Service keeps an eye on creek conditions. Hiking trails lead into the mountains, under shady groves of aspen along routes used by natives and settlers and to the peak of Mt. Herard, where hardy hikers find an eagle’s eye view of the dunes. High-clearance 4-wheel-drive vehicles can trek to the alpine Medano Lake, although the 22-mile Medano Pass Road may be closed by snowpack or other natural intrusions. The road crosses Medan Creek nine times on its way to the top. There is a primitive campground. For an overnight visit, there are 88 campsites at the Pinyon Flats Campground (half are closed in the winter), including flush toilets and drinking water. There are a few sites for RVs; there are no electrical or sewer hookups, but a dump station and water hoses are available during warm months. There are also many privately owned campgrounds, lodges and motels around the park. • Rocky Mountain Horseback Adventures: 719-298-9009, based in Alamosa. • Zapata Partners: 719-378-2356, based in the Medano-Zapata Ranch, owned by The Nature Conservancy. • The eco-focused Atalanta Association: 719-256-6200, based in Crestone. Visitors may also ride their own horses or pack animals in most areas of the park. Pets on leash are welcome in commonly used areas of the park, but remember that the hot sand can burn a pet’s paws and they are closer to the heat radiating from the sand so need more opportunities to cool down. It’s not safe to leave pets in the car during hot summer months.